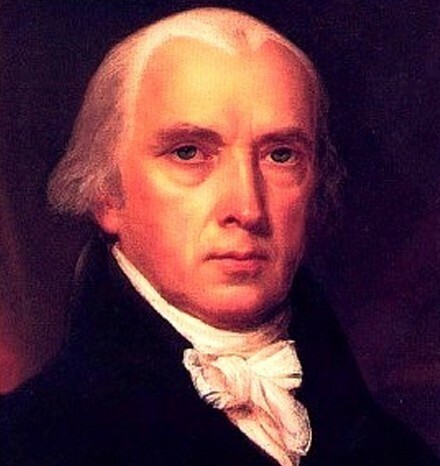 James Madison (1751-1836) was a writer, philosopher and politician, commonly regarded as the ‘father of the Constitution’ and a drafter of the Bill of Rights. Born near the shores of the Rappahannock River in Virginia, Madison’s father was a wealthy tobacco planter, one of the largest landholders in the colony. The young James Madison was a brilliant student but was physically small and frequently sick (he would be plagued with poor health for much of his adult life). Madison graduated from the College of New Jersey (now Princeton) in 1772. Four years later, with the Revolutionary War already underway, he was elected to the Virginia Convention, where he participated in the drafting of a state constitution and the Virginia Declaration of Rights. 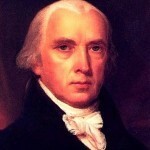 Despite his youth, Madison proved a skilful and tireless legislator. Armed with an expansive knowledge of political philosophy, from ancient civilisations to the Enlightenment, he understood the problems and pitfalls of government. Madison became an important leader in the Virginia legislature, the second Continental Congress and the Annapolis convention. History knows Madison best for his work in the 1787 Philadelphia convention, which embraced his Virginia Plan as the basis for the new constitution. Along with Alexander Hamilton and John Jay, Madison was a contributing author to the Federalist Papers that helped secure ratification of the constitution. From 1789 he sat in Congress, where he played a leading role in developing, drafting and enacting the Bill of Rights. Madison later served two terms as the fourth president of the United States.